what led to his candor? can the Barclays Center be built without him? His comments came in a wide-ranging interview in The Architect's Newspaper, headlined Q&A: Gehry at 80: A sense of movement and a few regrets. AN: Which other unrealized commissions do you most wish had been built? FG: The Corcoran Gallery in DC, the Atlantic Yards project in Brooklyn—I don’t think it’s going to happen. There are projects underway that are being threatened, and may not be completed. That would be devastating to me. Grand Avenue in downtown Los Angeles is also on hold. I wonder if "threatened" is a reference to the Beekman Tower project in Lower Manhattan, which may be built to only half the size projected. AN: You’ve cut back on staff size—what was the peak? FG: About 250, about a year and a half ago. We were doing Brooklyn and Grand Avenue, they were big staffs, 40 to 50 people each. Now we’re at about 120 to 125. While the New York Daily News said Gehry declared the project "dead," he didn't speak with complete certainty, so we should expect a statement soon from developer Forest City Ratner. After all, Mayor Mike Bloomberg said yesterday that he thought the project could get built without the Gehry design. If so, the Barclays Center naming rights deal, already under fire because of the AIG connection, might be reconsidered by the bank, since it was signing on to a Gehry arena, not a generic one. That raises major question marks about the developer's capacity to build an arena. The Daily News probably was correct, however, in observing that "The comment suggests the troubled relationship between Gehry and developer Bruce Ratner is over." On February 6, I suggested that Gehry wasn't talking about AY because he didn't want to jeopardize his relationship with Ratner, the developer of the Beekman Tower. Now that the Beekman Tower may be compromised, Gehry may feel more free to talk. On May 11, Gehry will appear at the New York Public Library for $25, in an event titled FRANK GEHRY & ALEX ROSS in conversation with Barbara Isenberg. Ross is the New Yorker's music critic--another panel that night involves Los Angeles Philharmonic conductor Esa-Pekka Salonen--and the conversation seems centered on Gehry's Disney Hall in Los Angeles. 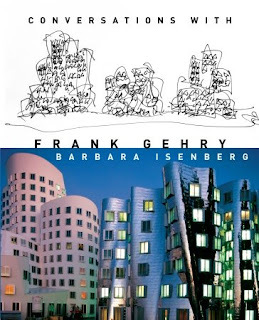 Isenberg is the author of Conversations with Frank Gehry, which reflects her interviews with the architect over the past 20 years; it will be published April 21. When Gehry appeared in New York in January 2006, he said, with dismay, ""I didn’t expect this to be a thing about Brooklyn--I guess I should’ve known better." Despite the focus on Los Angeles, this time, he should know better.